Martha Collins is the recently retired Pauline Delaney Professor of Creative Writing at Oberlin College and one of the editors of FIELD magazine and an editor of Oberlin College Press. She established the creative writing Program at the University of Massachusetts-Boston and taught at Oberlin from 1997 to 2007. 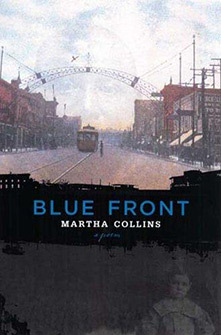 Blue Front, the book-length poem based on a lynching her father witnessed when he was five years old in Cairo, Illinois, was also chosen as one of "25 Books to Remember from 2006" by the New York Public Library and won an Ohioana Book Award. A selection of poems from Blue Front received the Laurence Goldstein Poetry Prize in 2005. The author of four previous poetry collections, including Some Things Words Call Do, Collins has also published two hooks of co-translations of Vietnamese poetry. Her previous honors include fellowships from the National Endowment of the Arts, the National Endowment for the Humanities, the Bunting Institute, the Ingram Merrill Foundation, and the Witter Bynner Foundation for Translation, as well as three Pushcart Prizes. the Alice Fay Di Castagnola Award and a Lannan Foundation Residency Grant. A native of Omaha, Nebraska, Collins earned a B.A. at Stanford University and holds an M.A. and Ph.D. from the University of Iowa. She currently resides in Cambridge, Massachusetts.